Plaques commemorate the official opening of the cantilever Story Bridge and the naming of the Bradfield Highway. A plaque also commemorates the workmen involved in its construction. 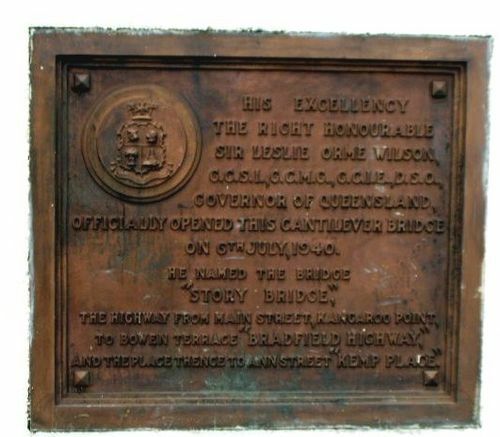 Additional plaques were placed on the bridge on the 13th August 1940 to the builders and administrators after criticism about their non-inclusion in the original plaques. The plaque commemorating the workmen also received criticism for its mention of the Queensland Labor Government in the inscription. The Story Bridge is a heritage-listed steel cantilever spanning the Brisbane River that carries vehicular, bicycle and pedestrian traffic between the northern and the southern suburbs of Brisbane, Queenland, Australia. It is the longest cantilever bridge in Australia. Until it was completed the bridge was known as the Jubilee Bridge in honour of King George V. It was opened on 6 July 1940 by Sir Leslie Orme Wilson, Governor of Queensland and named after John Douglas Story, a senior and influential public servant who had advocated strongly for the bridge's construction. Four men died during the construction of the bridge. The names of the builders and administrative authorities of the Story Bridge have now been placed in a prominent position on the bridge. Criticism at the removal of the names of members of the Bridge Board from one of the original tablets, and allegations of "party advertising" by the State Government, brought a promise from the Premier (Mr. Forgan Smith) that tablets commemorating the "engineers, contractors, a few others chiefly concerned with construction, and the names of members of the Bridge Board," would be placed on the bridge later. Yesterday two new plaques were fixed on the northern approach, five weeks after the official opening. They are not as large as those unveiled at the bridge opening, and do not bear the Queensland coat-of-arms. One reads: Evans, Deakin — Hornibrook Constructions Pty., Ltd. Directors, D. E. Evans, D.S.O., M.I.E. (Aust..) chairman, M. R. Hornibrook, A J. Deakin, R. Clark, W. S. Hurwood. Construction engineers, substructure, G. O. Boulton, M.E., M.I.E. (Aust.) ; steel fabrication, M. J. McKew; steel erection, L. R. Wilson, B.A., Sc, M.E.I.C." The other reads: "The Bridge Board of the Bureau of Industry: Chairman, J. R. Kemp, M.Inst., C.E., M.I.E. (Aust. ): members, J. D. Story, I.S.O., Colin Clark, M.A., D. A. Crawford, L.S., M.I.E. (Aust. ); designer and consulting engineer, J. J. C. Bradfield, C.M.G., D.Sc, Eng., D.E., M.E., M.Inst., C.E., M.I.E. (Aust. ); engineer, J. A. Holt, B.E., M.I.E. (Aust.). Courier-Mail (Brisbane), 14 August 1940.